Borderlinx | Buy Newegg and ship worldwide with Borderlinx. Cheap rates guaranteed. Seemingly taking the online world by storm, Newegg USAhas secured its position as one of the top internet retailers for an incredible selection of products. Newegg USA has, for over a decade, offered competitively-priced products from laptops, to home appliances, to video gaming systems, and much more, all with incredibly fast delivery and attentive customer service available instantly through online chat, phone, or email. Discover the savings, the selection, and the power to do more with Newegg USA. Newegg USA is proud to offer more than 3 million products, bringing truly unbeatable selection to its customers, along with millions of customer reviews to provide confidence in purchases. Newegg USA brands include industry leaders such as Microsoft, Netgear, Asus, Lenovo, and many more, so customers can choose from an amazing variety of only the industry's best products available. From Newegg USA cosmetics, to electronics, to outdoor items such as patio accessories and more, users are hard-pressed to find better selection or better prices in online retail. And with excellence in shipping and customer service, Newegg USA awards have spanned many industries, and include a Forbes Best of the Web pick, Computer Shopper Shopper's choice award for eight consecutive years, and several Gold Honoree awards by Bizrate, to name only a few. 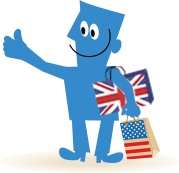 Now, customers across the globe can now buy Newegg USA and ship worldwide with Borderlinx! With cheap shipping, tax & duties determined upfront by our Shipping cost calculator, along with services such as concierge, free repacking and consolidation, Borderlinx makes international ordering from Newegg USA convenient, simple, and hassle-free.